This spacious condo has stunning panoramic mountain views from every window and balcony. It lies in the heart of downtown and is only a short walk for groceries, coffee (Tim Hortons/Starbucks), liquor and restaurants. Relax and enjoy views of the Rocky Mountains from your private balcony or the roof-top hot tub (accessible by stairwell). Enjoy an energizing workout in the fully equipped on-site fitness center. It is easy access to heated underground parking by elevator or staircase. There is a fully equipped kitchen with 7 modern appliances including a Keurig beverage machine and heated flooring. A 42 inch flat screen TV can be viewed from kitchen, dining area and living room with the open floor plan. Enjoy sitting in front of the gas fireplace while you watch your favourite sports, shows or movies. Keep in touch using exclusive complimentary Wi-Fi. This is a two bedroom unit with a queen size bed in each room. There is also a queen size hide-a-bed sofa in the living room. The loft bedroom is an open plan with a vanity, toilet and a corner soaker tub for added comfort. We will provide you and your guests a National Park pass to use during your stay. We are a family living in Calgary but love the close proximity to the Canadian Rocky Mountains with beautiful scenery and enjoy the fresh, clean, crisp smell of the mountain air. It’s the perfect spot to explore the Rockies from! The Three Sisters mountain background sets the mood, there’s a feeling here that you don’t get from most other places and it’s only partly because of the beautiful surroundings and crisp fresh mountain air. Canmore has maintained its identity as a Canadian mountain village, surrounded by wild land areas abundant with wildlife, lending themselves perfectly to any number of recreational pursuits. The Canmore Nordic Center played host to the cross-country ski and biathlon events of the 1988 Calgary Winter Olympics. It is one of the most beautiful places in all of Canada to live, work and play! Enjoy stunning mountain views from every window, exclusive complimentary WiFi and complimentary coffee and tea. Rest in front of the fireplace or on the balcony equipped with deck chairs and an electric BBQ. Catch a quick workout in our fitness center. Take a stroll to downtown Main Street with many unique shops and first class restaurants. There are two grocery stores to suit your needs. After a long day, you can relax in the soaker tub in the loft or in the building’s roof-top hot tub. It lies in the heart of downtown. Incredible panoramic views of Three Sisters Mountain from every window including bedrooms, living room and balcony. Shared Hot Tub: Hot Tub located on the roof of the building with panoramic mountain views. It is a great location ,walking distance to downtown and convenient shopping basically right next door.Great view of the Three Sisters. The upstairs loft bathroom is odd but again is described accurately in the ad.We were a single couple so that bathroom was not a problem but could be interesting if there were 2 couples! All in all I would definitely recommend and would stay there again. Beautiful Condo with a gorgeous mountain view overlooking the town. We enjoyed our stay at this spacious home away from home very much. View was terrific, beds were comfy ( as well as the sofa bed), kitchen was very nice and had all we needed! There's one full bathroom and one in the loft which is divided off plus a nice jacuzzi tub. Underground parking and the hot tub were a plus! The location is perfect--grocery stores and liquor vendors just a few steps out the door! Also it is a very short walk to beautiful downtown Canmore for some shopping! A playpen and high chair were provided easily for our busy grandson. It was a wonderful weekend in the beautiful Canadian rockies! My husband and I stayed at this lovely property while we were visiting Banff, and we absolutely loved it. The town of Canmore is delightful, and it was relaxing to stay just outside of the hubbub of Banff. The apartment itself contained everything we needed for a comfortable stay, the beds were lovely, there were ample towels (even beach towels for the hot tub or hot springs), the kitchen was well stocked, and all was clean and comfy. We adored the rooftop hot tub, it felt delightful to soak our bodies up on the roof after a long day of hiking. My favorite part of this property was the view...what a treat to open the blinds on our first morning and see the gorgeous mountains out of the huge vaulted windows. We will stay here again next time we visit Banff! Location was great and condo was well equipped. We loved having a kitchen enjoyed cooking food and relaxing in the space after long hiking days. Only downside was no AC and it was very hot during our stay. Fans can only cool a place so much in the hot summer! Thank you for your review and we are happy that you enjoyed your trip. Our condo will be equipped with AC units next year. We would like you to come back and visit us again soon. Everything you would want in a condo, and yet close to all of nature you'd want to expose yourself to. Walk a block and get to trails that take you out of town or walk a block or two and experience a great restaurant. Which ever way you choose, there are many great options. Listen to the Rocky Mountaineer come by or to coyotes close to town. Be lazy in a great room with kitchen and deck to cook in or on. Private and secure in an urban setting. Close to shopping, groceries, and the market. What more do you want? Thank you for your 5 star review! Please come back and visit us again. We stayed here while visiting Banff National Park and the condo was perfect. 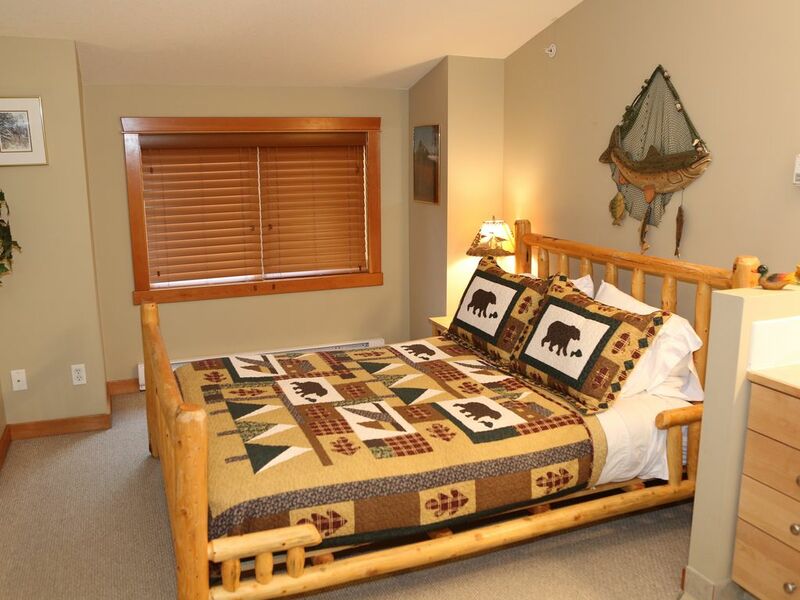 Way cheaper than staying somewhere in Banff, and just a short drive to the park, plus when you go back to Canmore for the day there are tons of places within a short (1-2 blocks) walk of the condo such as grocery stores, restaurants, bars, etc. Having the park pass provided was a huge benefit, beyond just the cost of the park pass. The line to purchase a pass was VERY long, and we got to completely bypass it and go straight in. If I were to plan another trip to Banff I would definitely stay here again. The only thing to note is that the upstairs is not fully enclosed, including the bathroom. We were two couples staying here and nobody had a problem with the arrangement. Thank you for your 5 star review! We are happy that you enjoyed your stay and look forward to seeing you again real soon! Canmore is located approximately an hour and a half from downtown Calgary and five minutes from Banff National Park east gate, Kananaskis Country and Bow Valley Provincial Parks, five world-renowned ski resorts, and six breath-taking golf courses. Canmore offers not only a spectacular location but unequalled outdoor recreational opportunities, great food, and great shopping in the heart of some of the world's most breathtaking scenery. DEPOSITS & PAYMENTS (Prices displayed on website are in US CURRENCY!!!) A 50% refundable deposit is required when booking. Final payments are due 30 days prior to arrival date. Bookings for Easter,Thanksgiving and Christmas holidays require full payment 45 days prior to arrival date. SECURITY DEPOSIT On the arrival date, a security deposit of $500 will be authorized on your credit card. The security deposit authorization will be voided within 72 hours after your departure as long as there are no damages, missing items, or additional charges. CANCELLATION POLICY *** This owner policy precedes any other VRBO policy posted*** Of course we hope you don't have to change your vacation plans. However, please take note of the following in case changes are unavoidable. For reservations cancelled more than 30* days prior to arrival, 10% of the full booking fee is retained. For reservations cancelled less than 30* days prior to arrival, 30% of the full booking fee is retained. Alternatively, reservations may be re-booked for another date within the following 12 months with a $25.00 re-booking fee. *Please note: Any amount paid for Easter, Thanksgiving and Christmas holiday reservations cancelled less than 30 days prior to arrival is non-refundable. **Please refer to Canadian dates for Easter, Thanksgiving and Christmas holidays (Christmas holidays will usually include the week before the 25th and until the week after New Year's).